Multi-day tours are all priced as standard tours (inquire about private tour availability and pricing.) 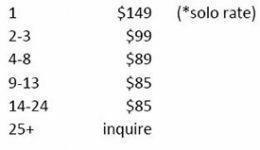 These prices do not include bike or camping kit rentals. We have full suspension bikes from Santa Cruz and Giant. All bikes are reserved on a first come, first served basis, and we cannot guarantee any particular bike. Upon booking your multi-day tour reservation, please give us your first and second choices for bicycle rental. It is automatically included in with all day tours. A camp kit (tent, sleeping bag and pad) may be rented for your multi-day tour. Prices are $65 for one person; $120 for two persons (using a 3-person tent.) Click here for details. * Standard tours require a minimum of 2 persons to go. If you are a party of one, and if you are willing to pay the solo rate, we will guarantee that your tour runs -- even if you end up being the only person on it. If, after making your reservation, someone else joins your tour, your rate will automatically drop to the 2-3 person rate. Our Day Tour price includes an aluminum frame Santa Cruz Tallboy 29" or 27.5"+ or Bronson 27.5" (or for petite riders a Giant Embolden 1 27.5".) Bikes come with helmet and 1 water bottle. Bike upgrades are available for $40 extra per day for Tier 2 carbon frame bikes.